Growing up in Quebec City, a very non-diverse “white bread” city, I was not exposed to all that many types of international cuisine. The best it got was ordering in some Chinese (more like chicken balls and sweet and sour spare ribs) or going to Pacini, which was our vision of the ultimate Italian fine dining experience at the time, but very seldom was I truly exposed to Indian food. My first experience with Indian food was in England. Several British friends of mine swore by their “sag aloo” (potato and spinach curry served with wondrous airy naan bread) and who felt the need to end every night on the town with a curry dish. This introduction to Indian food was the commencement of something beautiful. My mindset now? I love/adore/crave/fancy/appreciate Indian food. Plus, to think that this delicious food comes from the birth country of yoga and a country where people greet each other with “namaste” makes me love it even more. Most people think the curry dish is to India what poutine is to Quebec, when in reality Indian food is very diverse, taking on sweet or sour and mild or hot tastes. Whatever the dish, vegetables are an integral part of this type of cuisine, which makes the nutritionist within me jump for joy. Gulab jamun, rajma masala, chana dal – the dishes’ names themselves are just so foreign and amusing to try and pronounce. India is known as the land of the spices and indisputably lives up to this name. You should know, if you have a phobia of experimenting with spices (spicexperimentobia? ), today’s recipe may not be for you, you’ll soon find out why. Consider yourself forewarned. Speaking of today’s spicy recipe, allow me to introduce it. 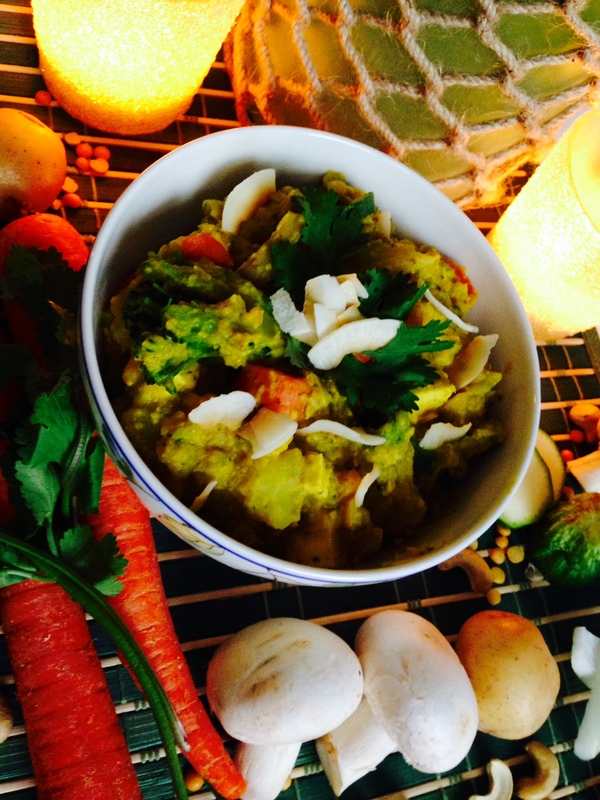 I have decided to make a vegan version of a great Indian dish: korma! 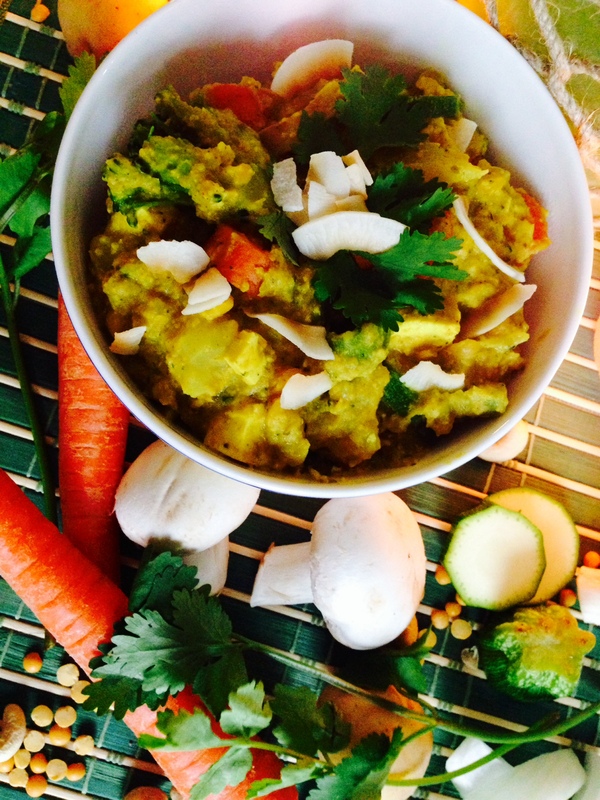 Korma is a recipe intended to be mild and is a ravishingly colourful meal, bursting at the seams with flavours. Fry the garlic and onions using oil in a skillet on medium to high heat. Once the garlic and onions are cooked, add in the potatoes and cook until potatoes they are golden. In a separate (large) pan, stir-fry the carrots, zucchini, brocoli, cauliflower and green beans, adding in the zucchini last as it takes the least time to cook. Next, prepare your sauce. In a blender, mix your (potentially soaked) cashews, dried coconut, water, coconut milk and spices (turmeric, cumin, chilli, paprika, fenugreek, garam masala, nutmeg, ginger root, cardamom). Blend until your sauce is as creamy as it gets. Try to blend all the chunks into smoothness. Add the tofu, lentils, garlic, onions, potatoes and freshly prepared sauce to the vegetable pan. Cook everything together on low to medium heat, adding water as needed (1/2 cup at a time) and stirring often to prevent burning, until all vegetables are cooked. 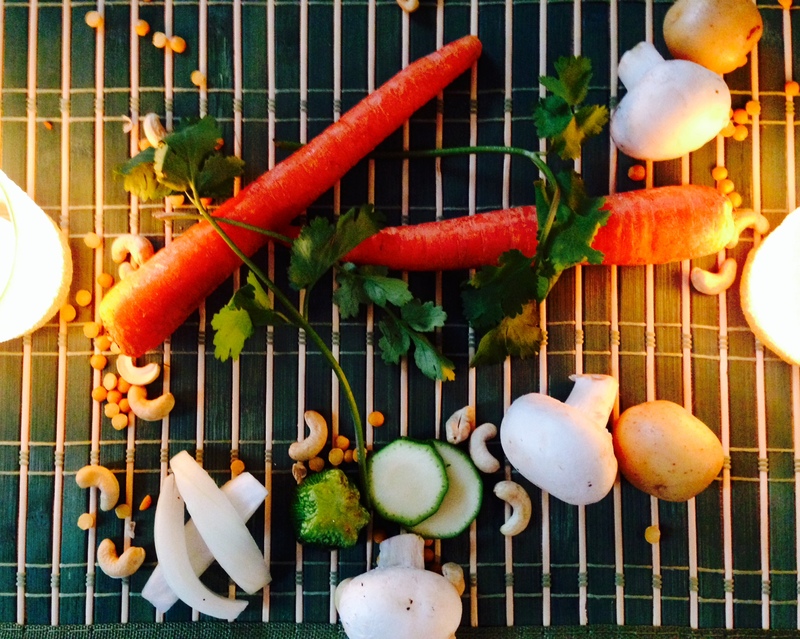 Garnish with raisins, cashews and coriander and serve. Trick of the trade: If your spice budget does not allow purchasing all these exotic spices, try buying a pre-concocted spice blend such as a tandoori spice blend which contains paprika, coriander, ginger, cayenne, cinnamon, onion, cumin and chilli. Tandoori is the magic spice 😉 .